Our latest restock has posted out. 100% cut to Super Ideal H&A (AGS-0 Ideal equivalent). We'll have pro photo/video late next week. My baby brother is hoping to propose soon and asked for my help with the ring, and I'm steering him towards lab grown diamonds since he can get a lot more bang for his buck, and we found a lovely one from Brilliant Earth that's 1 carat, but how far away are you guys from the first 1 carat stones? I remember December, but are you talking early, mid, or late? We have to wait on the jeweler for the setting which is going to be several weeks anyway, but if we could get him a Takara that would be even more amazing. We're still on track for January to have the first 1 carat. I'd love for him to be able to propose with a Takara H&A, but sounds like we won't make it in time. Just curious but what are the specs and pricing for the 1ct from Brilliant Earth? The ones I recall were quite pricey but I don't remember the cut. If we cut one now that wasn't H&A, we probably could hit the 1ct mark but then it wouldn't really be a Takara Eternity without the Super Ideal H&A cutting. Let me check again next week as we have 4 new pieces going into cutting but I'm not expecting any of them to be 1ct - should yield .75ct range, but I'll also see what comes out of the growth chambers this week as well. Just curious but what are the specs and pricing for the 1ct from Brilliant Earth? 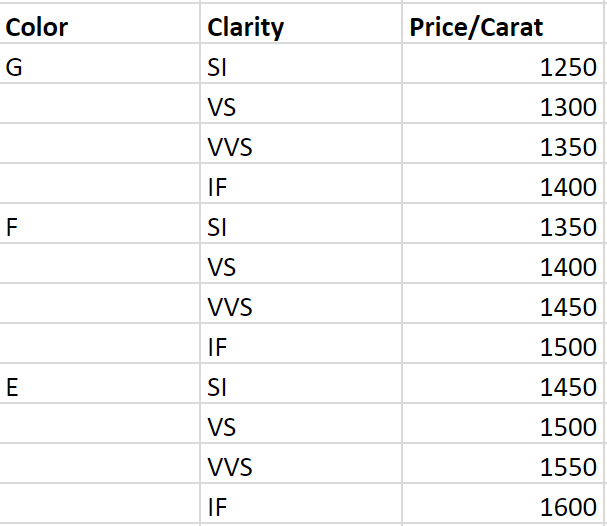 Specs on the one we've selected are 1.01 carat, I, VS2, "super ideal cut", excellent polish, excellent symmetry, and a 1.7 HCA score for $2,000 (which is his maximum budget for the center). We decided our priorities were cut, carat, clarity, and color. It's still a much better deal than a mined diamond of the same specs by far, sadly "ideal cut" from Brilliant Earth can vary quite a bit so there was a lot of use made of the HCA calculator. He apparently wanted to propose this December but he only asked for help with a ring a week ago and he and his fiance-to-be are stationed in Japan. Poor guy didn't realize how long it takes to get a ring made or the steps involved, and of course who knows how long the setting will actually take with it being the holiday season. He hasn't purchased the diamond yet, we're waiting until the CADs are all done, so, we shall see! It would be cool to have him get a Takara Eternity though. Thanks for the info. I've never used the HCA but I put in two of our Takara Eternities and got 0.9. I don't think that tool is precise enough though but it's interesting. The latest restock arrived today and I can say, without a doubt, the Takara Eternities are the most stunning diamonds I've ever seen. No joke....they are amazing. I have a larger H&A mined diamond and these outperform it. I think the difference is the Eternity cut has no bow ties, etc. in the H&A pattern so more total light reflection vs the bow tie style in the mined diamond H&A. Anyway, if you want to write a review I'll send you one for a week to see esp if you are going to see the one from Brilliant Earth I don't think we'll make it for his proposal though in terms of having a 1ct in December. Thank you Less, that is so incredibly kind of you, although my brother actually went with one of your Amora Eternity's! Don't get me wrong, I would LOVE to see (and photograph, and video tape, etc. ) a Takara Eternity in person, but sadly I wouldn't get to pit it against a Brilliant Earth lab grown diamond (Actually, I take that back, I live in a city they have a show room, if they would let me set an appointment to compare some of their lab grown diamonds to yours, I will!) . That said, if you are still up for it I would indeed love to write you a review! The HCA is interesting, it really isn't for much more than helping people weed through "bad" versus "good" cuts (if cut is a priority for you), but I found it useful in searching because "ideal cut" from various labs can be all over the place, and the first lab diamond I was excited about turned out to be close to a 5 (which is not good), and it let me know to keep looking. Some people get really hung up on that number, but you are correct, it is not the whole picture when it comes to determining a diamond's beauty. Anyway, my brother says he can "upgrade" later once the Takara Eternity's are available. Still, the ring is going to be gorgeous, and there will be many pictures of it shared once it's complete! Oh great, glad to hear he was able to get an Amora Eternity. We actually won't be making many more 1ct Amora Eternity's (last ones are in grading now) so if he got a 1ct, then that's perfect timing. I am more than happy to take you up on that! Why won't there be any more 1ct Amora Eternity's though? I would imagine them to be popular for earrings (I have a matched 6.4mm soaring hearts pair myself)? Hello! Are you ever planning on making 2+ carat Takaras? I am planning on proposing this summer and am in the market for a 2-2.5 carat lab grown diamond. Everything about the Takaras makes me want one!!!! It's very hard to grow the rough to be 'only' 1ct thickness is one issue (usually ends up larger as we can't 'see' how it's growing or not and can't risk stopping and finding it's only .25ct thick or similar , and then we don't want to take larger rough and 'cut it down' and lose all that rough and cash flow to just make 1cts. In addition, the 1ct size, even when grown to 1ct thickness which is very rare, is basically not profitable for us due to the high cost of each growth run. It looks like we'll have a few more coming in the next restock and that's the last of them. That's also why 1ct in Amora has been pretty rare overall. We're hoping to have 1ct Takara's in January and so Takara Eternity's will take their place for 1ct size going forward. Hi Amcd - thanks for the kind words re: Takara - we will definitely have 2ct+ Takara's, it's just a matter of when. I would guesstimate this summer, but can't guarantee it. We are tracking for 1ct in January, and hopefully 1.5ct in Spring and then 2ct and up in the Summer. is there a way to see the cert for each diamond or any other way to find out what kind of inclusions the diamonds have ? Almost all of the inclusions are clear and due to another diamond starting to grow inside the larger diamond (termed natural when found in mined diamond). Thus, the SI clarity is a bit misleading in the respect that it's very difficult to see as it just affects the light refraction a bit vs say a carbon spot that is dark and is quite visible with the eye. Yet both are SI grade. The grading reports don't have a clarity plot so that wouldn't help, but the main thing is we are cutting to maximize the visuals and so the inclusions are generally of the clear and not obvious type as noted. You can also email us if you want more specific details on a given diamond and can get that to you. Could you be privately commissioned, at a premium price, to create a 2.5 carat by Spring? I figure the answer is no since you're busy but it's worth a shot!!! !